Pope Francis asked indigenous people for forgiveness and for their help in dealing with climate change during his recent trip to Mexico where he also said a mass at a basilica honoring an indigenous saint and then at a mass that preceded meetings with indigenous leaders from several Latin American countries, parts of the service were translated into three indigenous languages. The Pope began his trip with a visit to Mexican government officials but spent much of the next four days meeting with and honoring Indigenous Peoples from all of the Americas. On the second day of the Pontiffs five day visit to Mexico he said mass at the Basilica of Guadalupe, named for the Virgin of Guadalupe who, according to church legend, appeared to the indigenous Juan Diego and where, last November, for the first time in Mexican history the mass was said in Nahuatl, the language of 1.5 million people in Mexico. “We cannot remain deaf before one of the greatest environmental crises in history, and on that score you have much to teach us,” Pope Francis said at a mass in St. Cristobal de Las Casas in Chiapas. “Your peoples have been misunderstood and excluded from society. Some have deemed your values, culture, and traditions inferior. 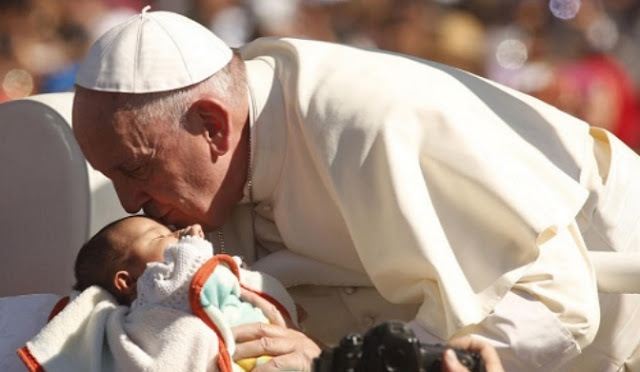 Others, giddy with power, have forced you from your lands and contaminated them,” the Pontiff continued. The mass in St. Cristobal de las Casas also featured the reading of biblical passages translated into Ch’ol, the psalms into Tsotsil, the homily into Tzeltal and the singing of the Our Father prayer in Txotsil. While the saying of mass in those indigenous languages by a pope in Mexico is an historic first, this was not the first time Pope Francis had officiated mass that was translated into an indigenous language nor was it the first time the Pontiff had asked forgiveness of indigenous people for the brutality inflicted on them by European invaders in the Americas. 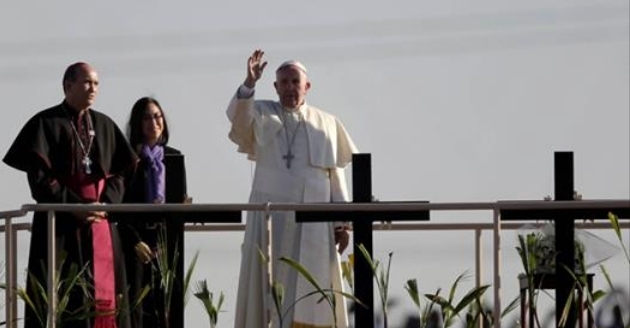 “We humbly ask forgiveness, not only for the offenses committed by this same church but also for the crimes committed against the original people during the so-called conquest of America,” the Pope said in a mass in Bolivia. After the mass in Chiapas, the Pope met with indigenous leaders from the region as well as some of their families. 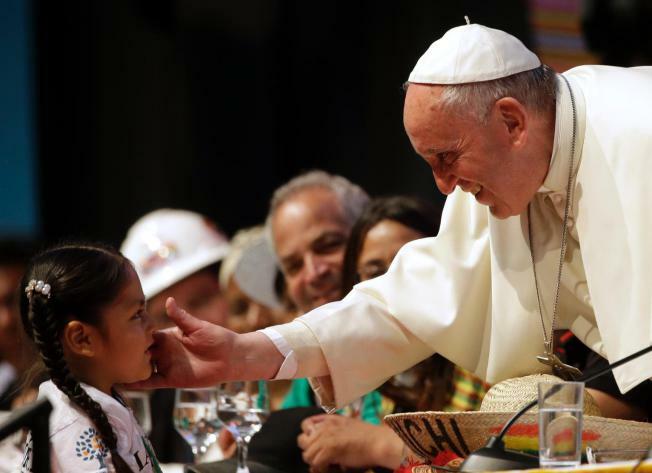 Immediately prior to the Pope’s visit to Chiapas, a conference of indigenous leaders from 15 Latin American countries came together to discuss land rights issues and the implications of the Papal Encyclical entitled “Laudato Si” in Spanish. 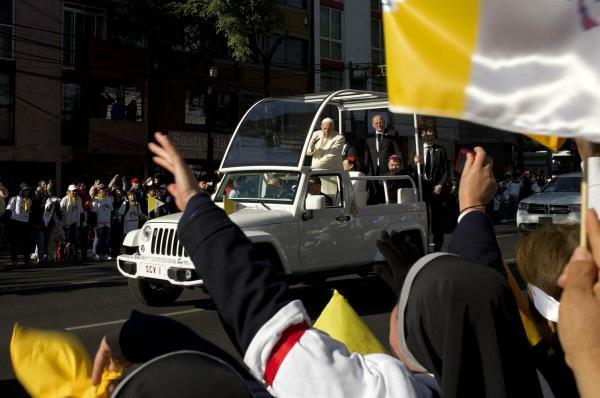 The Pope wrapped up his visit to Mexico in the border town of Juarez where he first visited a prison and then said mass in a large stadium. He also said a prayer near the US/Mexico border in an area filled with small crosses erected to honor the thousands of migrants who have lost their lives in the crossing. Migrant rights advocates have noted that many of those migrants are indigenous from Mexico and Central America. 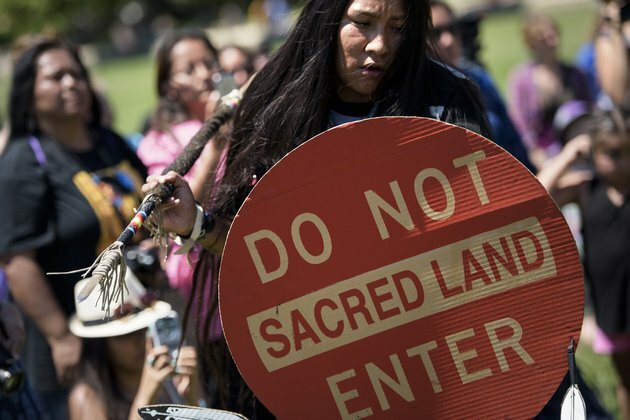 Responses to "Pope asks for help from Indigenous people because of their knowledge on climate change"
I would be more impressed with his wish to enlist our aid if he hadn't completely ignored the history of the missions in California and the slavery and genocide by canonizing Junipero Sera. He lost my support at that time. This is so exciting! It gives me Hope. Not only for the clarity of His Holiness in His words and actions, but for His statement asking for the help of indigenous peoples to please share their knowledge of climate change. I believe this will open some minds to messages indigenous peoples have been teaching for centuries. I am so gratefull. I am sorry for the omission of truth and history. I agree it is crucial. I also support what he did do.